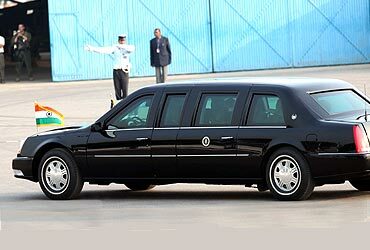 The Air Force One carrying Obama, his wife Michelle and the official delegation touched down at Delhi airport at 3.19 pm. 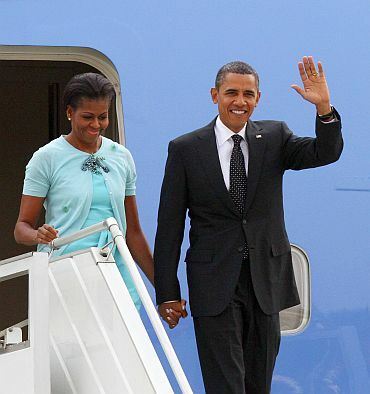 The US President and the First Lady waved their hands while getting down from the aircraft. Soon after alighting from the aircraft, Obama hugged Dr Singh after shaking hands with him and greeted his wife Gursharan Kaur with a peck on her cheek. Michelle did the same to Dr Singh and Kaur. The couples were seen chatting for a few minutes before the visiting dignitaries introduced them to officials in the reception line including Minister-in-Waiting Salman Khursheed, Foreign Secretary Nirupama Rao and Indian ambassador to the US Meera Shankar. In a special gesture, Dr Singh accompanied by Kaur received Obama and Michelle, signifying the importance India attaches to the US President's maiden visit. During the visit, specific announcements on issues like counter-terrorism, regional security and clean energy are expected to be announced, after talks between the two leaders on Monday. 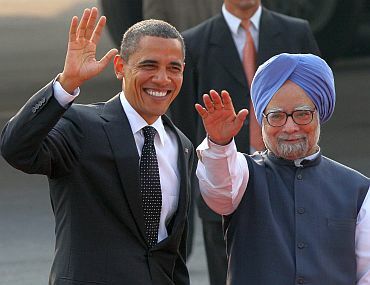 Dr Singh had received Obama's predecessor George W Bush at the airport when he visited India in 2006. The prime minister had also gone to the airport to personally receive Saudi Arabia King Abdullah. Obama, who arrived in Mumbai on Saturday afternoon, paid tributes to the victims of the 2008 Mumbai carnage. He had said that his stay at the iconic Taj Mahal Hotel, one of the targets of the 26/11 terror strikes, was intended to send out a strong message. Before embarking for Delhi, Obama and Michelle celebrated Diwali with children in a school in south Mumbai and then interacted with students at the St Xavier's College in a typical US town hall style.